Yeah. I’m done. Had these tickets since 1999. I can’t justify giving any more of my money to this team. I was at the game yesterday and there were two new guys sitting next to me. I asked them how they got the tickets. The guy said he bought season tickets last year. No PSL. THAT WAS THE LAST STRAW!!!!! I'm sorry man. Maybe if the team put more of an effort into winning, we wouldn't have to deal with watching cowpoop. I’ve been talking to EVERYONE I know. They all just laugh at me. If anyone wants to sit in section 149 row 29. JUST wait until I stop buying tickets. My wife and I just bought a WV cabin. Probably going to spend most weekends there anyway. How can you keep a coach that is going to be 1-31? 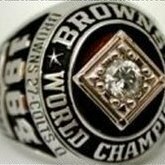 Just curious though.....beyond the team just sucking....is there any other reason that you have problems with Haslam? He got rid of the PSL’s so anyone could buy tickets without having to buy the PSL. Made them almost worthless. Screwed over the most loyal of fans. That isn't true my man. People who move in to PSL seats like yours are ticket holders seeking a upgrade or people who aren't ticket holders and but them and want better seats then what the Browns are going to offer.. People off the street get way uppers to start if they don't buy from a PSL holder.. Plus, you should have never thought that a PSL was going to gain value. I bought mine maybe 12 years ago....from another PSL holder. I have since moved to the club section. My section is 2 seats away from being sold out. We start winning, it will be sold out. I am pretty sure I can make my PSL fee of $2000 for my two seats back, plus a premium. If we don't get better, that $2000 was spent over a decade ago. I don't really care if I get it back or not. I've enjoyed my run. Sorry man, you sold low. You are wrong. The people next to me stopped buying their season tickets. They gave up the psl’s. Without selling them to someone else The new people came in, right off the street, and bought those seats WITHOUT having to buy the PSL’s at all. nothing will be available when this team starts winning again. That’s fine. I spent enough.